The first two years of med school consist largely of plenary lectures. This week, though, marks the end of that era. Our rotations begin next week. I look forward to the idea of being in the hospital (as naive as that may sound to clerks and interns who'd rather spend the day elsewhere) rather than merely standing as a visitor, as we did in our first and second years for limited patient encounters. For convenience, the class has been divided alphabetically into eight blocks consisting of 20 people each. Every block has an assigned department in the hospital to rotate in at a particular period in time. That means I'll never see my other classmates as often as I used to, and that my world will largely be confined to my block, which I have been blessed to have. My block rotates in Surgery first. We've already been assigned to buy animal meat—pata, in the vernacular—so we can practice suturing. 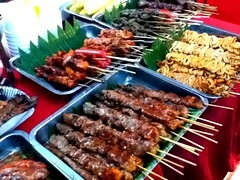 The plan is to have a pata party of sorts thereafter. I might do some academic reading this weekend, but the rain and the cold weather tempt me to do otherwise. This sudden turn of events did not really sink into me yesterday. I guess the Pharmacology exam was so exhausting to prevent any internalization. But I still had the usual lunch with the guys, among my closest friends in med school. They, too, shared my enthusiasm for the coming months. Some of them belong to other blocks, but I hope I still get to talk to them once in a while when the hard days come. In all this, of course, I'm overwhelmed by the Lord's sustaining grace. The reason why I can look forward to next week is my confidence that He will be with me, my strength and joy. I also took the free time last night to meet my MBB friends. During my commute to Glorietta, where I was supposed to meet Wegs Pedroso earlier, I bumped into med classmate, Kay Rivera, who was on her way to a reunion. What were the odds? Over snacks, Wegs related to me her unfolding love story, which I found amusingly romantic. I haven't seen her so self-conscious. 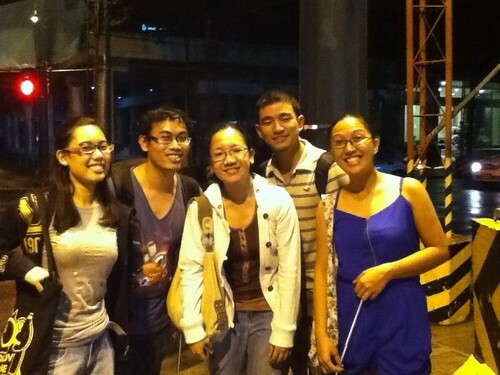 At around 10 pm, we met Anna Robles, Titus Tan, Polo Gaite, and Dianne Deauna. 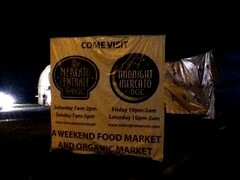 Together we went to Mercato Midnight Market at the Bonifacio High Street. When we got there, I saw classmates from med school. What a small world. From right: Mindy Santiago, Bryan Mesina, Mervyn Leones, Scott Ong, Roger Velasco, Janna Olivera, Pito Magno, and yours truly. (Photo: Bryan Mesina). I also spotted Ivan Burog with some friends. The band was actually good. 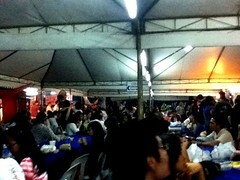 There were many food stalls. 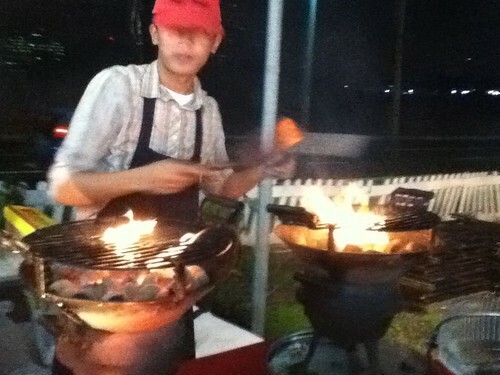 Most of them had smoking hot grilled food. The people were friendly. 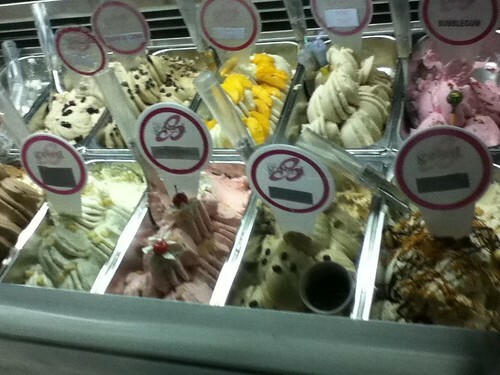 Booth owners gave us free samples of what they were serving, especially the gellato. The place served healthy meals at reasonable prices. 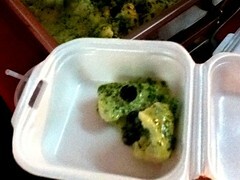 The potato salad (Php 40) and the fish fillet in pesto sauce (Php 105) were my favorites. 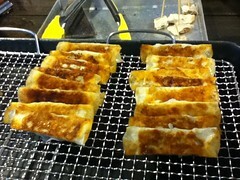 This wrap had green chili pepper with cheese inside, dipped in sour-sweet red sauce. Chesca Laconico, whose work is now business-related, also joined us. I didn't realize we were with a celebrity until people from UP Pep Squad came to our table, asked if they could have a picture taken with Titus Tan, and cheered for him. They even performed lifts! Name added, Di! Sorry for the oversight. Kitang-kita ka naman sa piktyur eh. 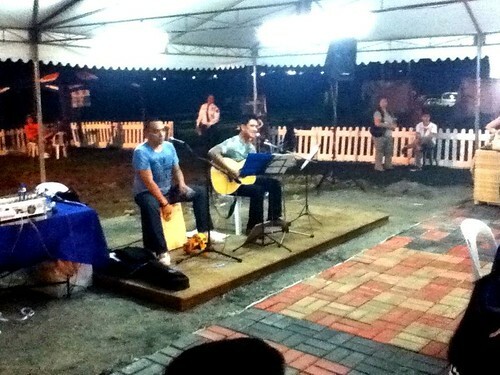 Lol, picture with Titus Tan? That's so funny! :)) Kuya Lance! I miss your face and voice! Oo, Pat! Haha! How are you doing?